Red Sox bullpen on it's last legs? There are many questions about the Red Sox bullpen after the meltdown yesterday against the Royals. Is Matt Barnes the reliever to lock down the eighth inning? Are Robby Scott and Heath Hembree effective enough? Why can't Joe Kelly stay in the game longer than an inning? What is the deal with Craig Kimbrel not being used for more than three outs anymore? A look at the American League East standings shows the Yankees losing a big lead on the top slot by dropping seven of their last eight games, due in large part to a bullpen that can't close out games. Their bullpen had given up 16 earned runs in 26 innings in that span, a collective 5.54 ERA. 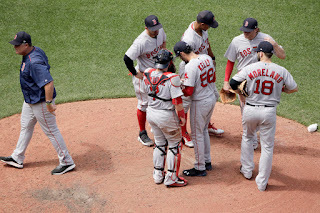 Going into the game leading the AL East, the Red Sox have had a bullpen that was dominating, second in the American League as Nick Cafardo points out. Over the last 12 games they posted a 1.11 ERA and have a collective 2.80 ERA overall, something the Red Sox have never done before. Barnes has been a pretty steady feature for the Red Sox this season. He has been manager John Farrell's go to reliever to bridge the eighth to Kimbrel in the ninth. From the end of May up to yesterday he was lights out with just four walks, 13 SOs and a 2.00 ERA in nine appearances. Let's assume it's just a bad day and not Barnes on his last legs when he walks the first two hitters he faced yesterday, a cardinal sin for any reliever. Barnes shall be returning and effective soon enough. Scott has been a fantastic addition to the Red Sox bullpen, pretty much lights out and consistent all season. For the last two months up to last night he has issues just four walks and compiled 10 SOs over 19 appearances boasting a 1.42 ERA. Giving up a walk and letting fastball leak over the plate for a homer can happen to anyone. His velocity is not down and he's useful in diverse situations for Farrell, so expect him to continue to be effective. Hembree has been more volatile this season, with more inconsistency in his run prevention than previous years with the Red Sox. In his last 14 appearances hitters are batting .304 AVG against him, they have a .316 OBP and are slugging .589. These are nail biting numbers when he enters a game, but he has only walked one hitter in the last 57 faced. Expect Farrell to continue to leverage Hembree in favorable match ups going forward, as he can be effective in the right situations. Kelly has had arm and elbow issues so Farrell has been very cautious with his hard throwing reliever. Kelly's only pitched on consecutive days once this year and has rewarded Farrell well for his caution. In the last two months he has been used almost exclusively for a single inning or less, facing 68 hitters, striking out 18 and walking just seven. This is not a problem for Kelly's who has a 0.00 ERA. The Red Sox have the hard throwing reliever in Kelly instead of a starter, he's lights out right now with +100 mph fastballs. Kimbrel, up to yesterday, had been used by Farrell eight times for more than three out saves. He seems to be shying away from doing that much more this season and stated that it was not even an option for yesterday. "Given the workload that he went through, what he was feeling coming out of those three particular appearances, that wasn't something that we looked to entertain," Farrell said. 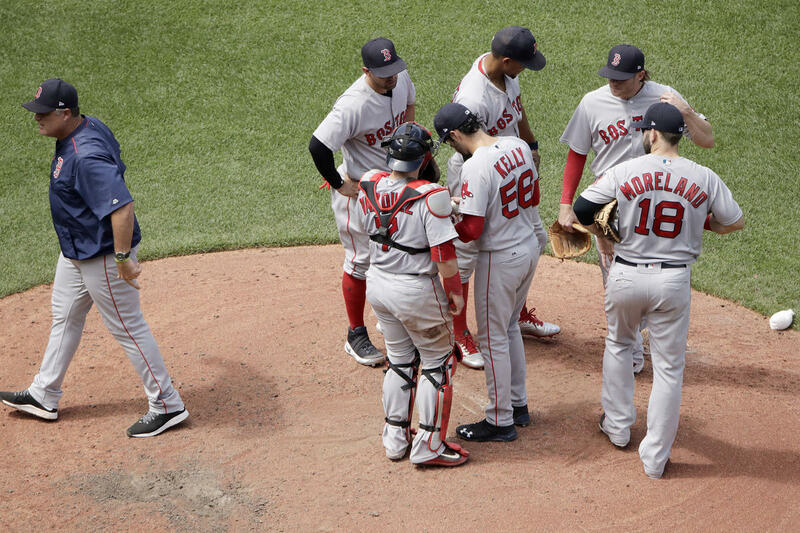 It does not look like the Red Sox bullpen is on it's last legs. Maybe the problem lies in the Red Sox ability to put runs on the board when needed? By putting Pablo Sandoval on the disabled list with an ear infection they seemed to have found a solution for the non-productive third baseman, but what about the designated hitter? Currently Hanley Ramirez, the Red Sox DH, is failing to put up numbers even close to the caliber the Red Sox are used. He has just nine homers , six extra base hits (all doubles) and only 26 RBIs. For the month of June he is hitting .197 with only three HRs, one extra base hit and 6 RBIs. Andrew Benintendi who's in his first full season with the Red Sox, homered on his 100th hit in the majors last night. He has 10 HRs, 10 extra base hits and 40 RBIs. He's hitting .297 in June with five homers, 2 extra base hits and 13 RBIs. Forget the bullpen for now, could it be there's an elephant in the room and the Red Sox are ignoring it in the DH spot?